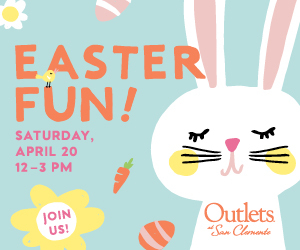 A fire that broke out on May 7 shortly after 1 p.m. in the 34100 block of Capistrano by the Sea in south Dana Point was caused by “human activity,” according to the Orange County Fire Authority (OCFA) investigation team. 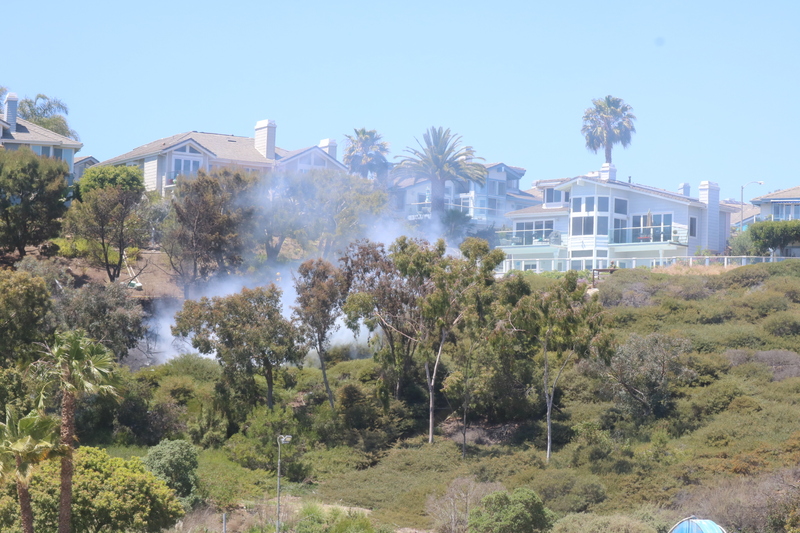 OCFA received a call at approximately 1:15 p.m. on May 7 that a fire had broken out in the brush behind the Chevron gas station and near residential buildings at the intersection of Pacific Coast Highway and Del Obispo Street. A number of citizens took action, even turning on neighborhood sprinklers, in an attempt to keep the flames, rising up the hillside toward the residences, at bay. Twenty-five OCFA firefighters worked to keep the fire contained and away from residences, and the fire was put out after OCFA dropped water from a helicopter. Orange County Fire Department Public Information Officer Captain Larry Kurtz said that no arrests were made due to a lack of evidence from the fire damage. After the fire, Dana Point Times spoke with a resident at the scene who wished to remain anonymous for fear of retaliation, who said that homeless encampments in the hillside have been an ongoing issue for months. They said earlier that day, a man, who had been seen entering that same portion of the hillside regularly, could be seen and heard there. After the fires had been put out, a variety of human items could be seen strewn about across from the concrete drainage ditch. By 10 a.m. the following day, those items had been removed. Orange County Fire Department Public Information Officer Steve Concialdi said that the fire burned one-eighth of an acre of eucalyptus trees. An arrest/s need to be made in this incident! OCSD knows exactly the individuals who come and goes from each of the encampment areas. Residents have been talking to the Council about these specific areas for at least a year, and they continue to be ignorant of anyone who actually has anything worth losing. All the Council and the City Attorney care about is the boogeyman in the form of ghost legal suits, but are doing NOTHING to actually safeguard the town they are elected to work for from actual, present problems. We have to stop accepting this as if they are dictators. They’re elected local reps, nothing more. But also the actual transient individuals who are causing the problems need to be held directly accountable. They are not victims or children. Even if the arrest doesn’t 100% stick and they are released quickly because of terrible State laws, they need to be held accountable and not just continue to feel they can get away with murder. Pun intended. This is arson/reckless use of fire cannot go ignored with just a shrugged shoulders from the Fire Department, the City, or from Dana Point Police Services. If you don’t run this to ground, it will just become more and more accepted. Transients are wearing police officers and fireman emotionally down, and now they are not even fighting the good fight to protect small neighborhoods from being set on fire. How much lower can we get, Dana Point?! We rely on people with the call to public service to ACT, not say “sorry tax-paying public, you voted for this so here you go.” We all didn’t, and still need your help while working on reform. Sorry the fire-starter didn’t leave his license behind to make this an easy one, but I’m sure the photos and the people who live there who identify the same person/people will suffice. The transients who did this do not care about the damage they inflict, or the community they drain dry of resources and compassion. They are struggling to care about their own wellbeing, and the wellbeing of those who were close to them before they ended up on our streets as everyone’s problem. A fire from a kitchen appliance set the tv-watching world up in arms over Crockpots. But these people start a fire between a residences and a gas station and it’s no big deal?! What reality is Dana Point living in & willing to accept?! Citizens need to start stepping up, all together, and demand the right things get done by non-transients/homeless as well. Our right to safety has been stolen just as much as their “right” to be homeless has been enforced. I couldn’t set a fire to the hillside and go free. Neither can they. How can anyone pretend this isn’t way more real and life-changing than an unnamed La Jolla lawyer letter that multiple meetings and special sessions were scheduled over? 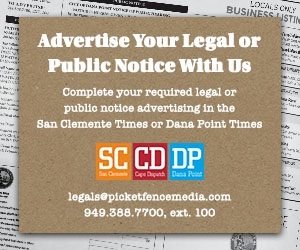 What are you waiting for Council & OCSD – why/when does someone have to be seriously hurt or killed before any action happens? Who gets to be that un-lucky person who leaves a massive wake of pain behind them? Hold yourselves to some standard and stand for something, for God’s sake. Thank you for your comment. Some of our neighbors live in fear each night. I spoke with a neighbor yesterday near the fire and trail. She lives in fear. She can hear them outside on the trail. Sometimes scratching on her lower windows. It’s awful. Cars broken into and we get scolded for mistakenly leaving our car doors unlocked. Like we deserve it. Anything left outside, taken. Dispatch is rude when we call. Police appear annoyed they have to come here. We are told to report, but feel like we are an inconvenience or over reacting when we do. t’s awful. . I doubt they are investigating. No one died. No homes burned. Not enough to bother with trying to find this guy. We are not a priority. Thank you for your comment and for caring. I wish more people did. By the grace of God we dodged a disaster. Because of a lack of laws and common sense when it comes to our homeless issue, the only blame is with the HOA for not having their hillside cleared. Good news is hillsides will be cleared. Bad news is they will move to someone else’s hillside. I pray it doesn’t take someone losing their life before people wake up. Our city is not safe.